Now that your little one is transitioning from a baby to a toddler, it changes everything. One of the big changes that come is a new bedding arrangement, and with that comes something your baby has probably never had before: a pillow. Toddler pillows are smaller in size and support your child in unique ways! This toddler pillow buying guide will help you choose a pillow that is the perfect fit for you and your toddler both! Material: This refers to what the toddler pillow is made of. Most of the time they are cotton with polyester fill, though some of them are foam or are stuffed with cotton as well. This comes down to personal preference. 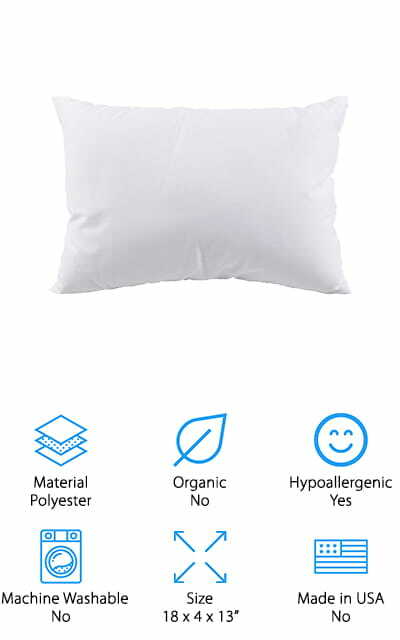 Organic: Some toddler pillows are rated to be organic, which means that the materials used to make them have no added chemicals or other ingredients. It’s made of completely natural materials without pesticides, GMO, or flame retardant materials. 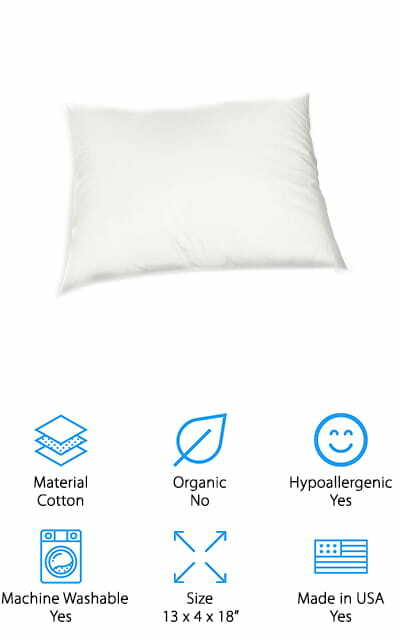 Hypoallergenic: This mostly refers to what the pillow is filled with. Hypoallergenic filling is resistant to mold and mildew naturally and doesn’t contain any chemicals or materials that will trigger your child’s allergies for the most part. Machine Washable: Can you throw the pillow in the washer and dryer to clean it? Toddler pillows should be cleaned regularly, and the most convenient way to do this is to throw it in the washer and dryer. It’s easy! Size: These are the dimensions of the pillow. How big a pillow your toddler needs is mostly down to personal choice, but most of them are about the same size to fit smaller heads and smaller beds. Made in USA: It is really important to some people to know where their products come from. Buying a product that is made in the USA is putting money back into corporations in this country and helping our economy. Now that you know what to look for when you start shopping, we can get to the best toddler pillow reviews! Choosing the best pillow for your little one’s first big kid bed can be as easy as reading through this list and choosing one of these great pillows! We’re sure that you and your child will love it! Check out our top and budget picks first, because that will show you the range of what’s available. The Little One’s Pillow is the best toddler pillow for sale right now. It is made by a well-known company that is trusted for their quality in the USA. 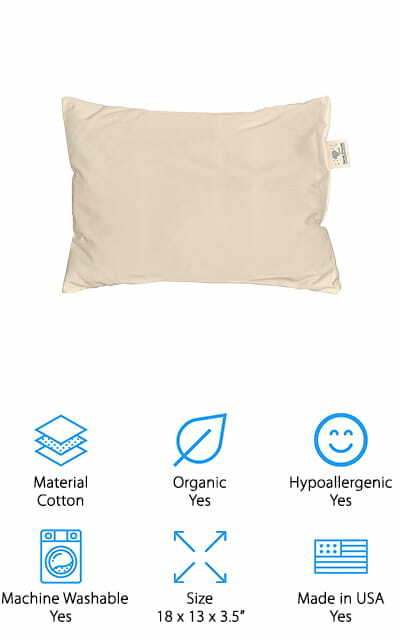 The cotton shell is completely organic, and if that’s something that you appreciate in your bedding, you’re really going to love this pillow! The filling is completely hypoallergenic as well and contains no extra chemicals. It is super soft, and your toddler gets a comfortable night’s sleep! The great thing about this particular pillow from this particular company is the customer service. If you need a pillow with more or less filling, they will accommodate you as a gift for trying their products! That is pretty amazing! The fiber on the inside never gets lumpy or sticks together after putting it in the washing machine. We love how much care the company has put into making a product that you and your toddler are happy with! 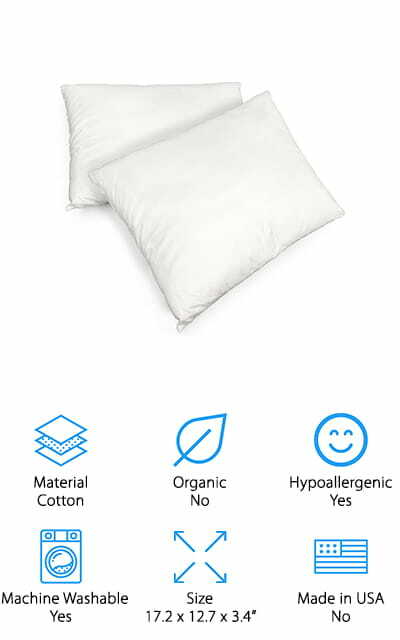 Dreamtown makes the best cheap toddler pillows on our list, and to highlight their quality as a company they offer a complete satisfaction guarantee. It’s the perfect pillow size for your toddler’s little head – not too large, and not too small. 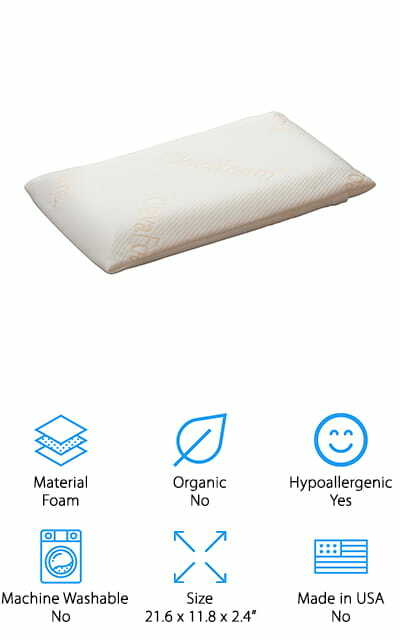 The filling is dense but soft enough that your little one can get a comfortable night’s sleep. 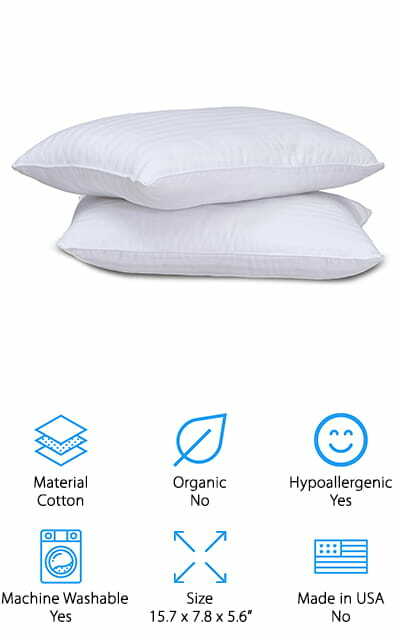 The pillows and cases are completely hypoallergenic and resistant to mold and mildew, so your mind can rest at ease about that. Because it’s a poly/cotton material blend, it’s both affordable and easy to wash without worrying about shrinking. It’s a great pillow to go on your child’s first big-kid toddler bed, as it will make them comfortable and make bedtime fun! We love the dedication that this company shows for their products. They have some amazing customer service! Instead of a stuffed animal, have your kid sleep on a comfortable, perfectly-sized pillow. You’ll both sleep better! The Little Sleepy Head Toddler Pillow is made completely of hypoallergenic cotton. It’s the perfect amount of snuggly, so comfortable that your child will want to drag it around everywhere. It’s a perfect size and shape for use in a toddler bed. That’s amazing! It’s made right in the USA, and it’s a big enough company that you can also buy pillowcases that are an exact fit. They have spent so much time making sure that each pillow has exactly the right amount of stuffing to make it comfortable, to make it hold its shape instead of lumping up. And it’s washable, so you don’t have to spot wash the pillow anymore. The cotton is nice and soft, and won’t trigger any allergies that your child might have. What’s more, it’s backed by a guarantee that you’re going to love it! If you or your child don’t absolutely love it, you’ll get your money back! This toddler pillow from A Little Pillow Company is pretty amazing. First off, it comes with a pillowcase, so you won’t have to try and find one that will perfectly fit. You can even buy additional pillow cases separately, all of which will fit without any extra fabric, which is important for small children. 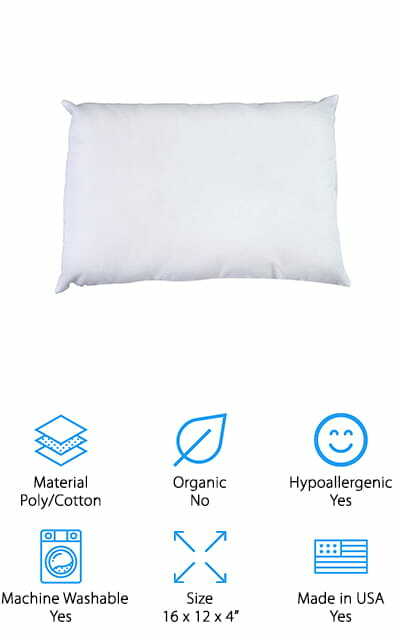 You can use the pillow without a pillowcase as well because the shell or cover is 100% cotton. The filling is a cluster of fiber that is completely hypoallergenic and contains absolutely no flame retardants. It’s one of the best-known and well-trusted brands for toddler pillows, and this pillow lives up to the expectations! It’s even double-stitched so it’s extremely durable for your little one. Whether you use it with the pillowcase or without, you can throw it in the washing machine when it needs to be cleaned, and dry it in the dryer without worrying about damaging it or the filling getting lumpy. My Little North Star makes the best organic toddler pillow on our list. The shell is completely natural, organic cotton, and the fill is hypoallergenic. It’s completely free of any chemicals, including pesticides, fungicides, or herbicides. It has no flame retardant chemicals or even repellents for dust mites. Your little one won’t have any allergic reactions to this pillow! It’s the perfect pillow for children between the ages of 2 and 5. It’s breathable and soft, so your child will have the best night’s sleep – every night. The smaller size is perfect for your toddler’s small head. It also makes it perfect for use as a travel pillow, to help your child sleep or nap better during longer trips. You won’t need a pillowcase with this pillow if you don’t want to use one – it’s perfectly fine on its own. My Little North Star has excellent customer service, and they will be happy to help you with any issues! The Equinox Pillow Set is amazingly soft, with a cotton cover and a silicon microfiber filling. 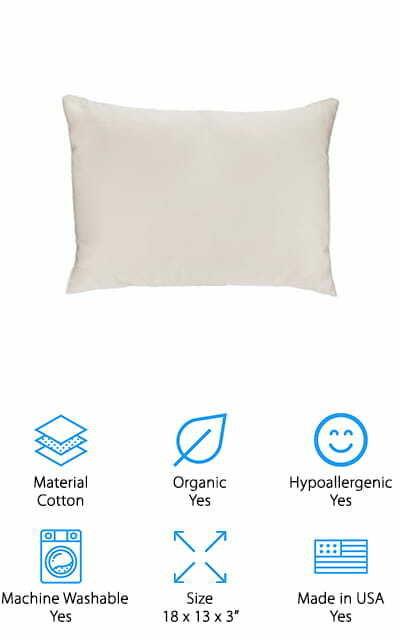 This unique composition means that the pillow how the perfect amount of fluff to make your baby completely comfortable. The value is what really makes this set shine – for the same price as a single pillow from most other companies, you get two! Keep one for use on your toddler’s bed and use the other as a travel pillow or to keep at grandma’s house. You can machine wash and dry these pillows without fear of the filling clumping together. The filling is hypoallergenic while still being resistant to mildew, dust mites, and even mold! We love that. There a 30-day money-back guarantee if you or your child doesn’t like the pillow. Equinox will give you 100% of your money back if you end up sending the pillow back. But we’re sure that you are both going to love it! Clevamama makes this great, luxurious toddler pillow. It’s the first on our list to be made of foam, which allows air to flow through the pillow. It’s breathable, hypoallergenic, and draws moisture away from your child’s face to help increase airflow. 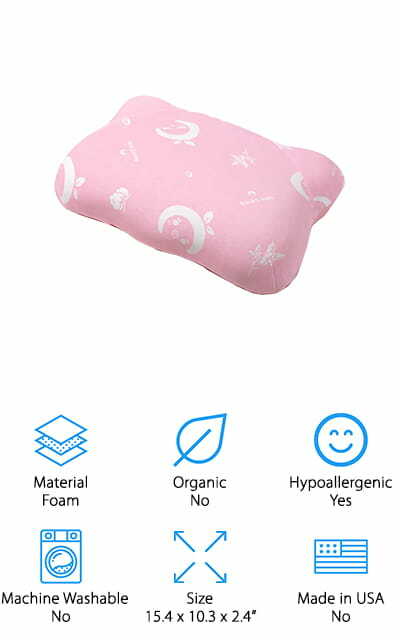 It is a perfectly comfortable pillow for your child from the age of one year old. It has reduced heat retention, so it doesn’t get hot on your baby’s face. There is a reversed zipper cover on the pillow from purchase, which is interior so it doesn’t scratch your baby’s face while they sleep. You can remove this cover and throw it into the washing machine and dryer, making it super easy to clean. Because of the foam that it is made of, this is one of the best toddler travel pillows that we saw during our research. It’s the perfect size for your toddler, with a comfortable, genius design with a focus on comfort. The Best Toddler Pillow is unique on our list because it isn’t made of cotton. The outside of the pillow is made of microfiber cloth, so the pillowcase is practically built-in! The microfiber is soft and comforting on your toddler’s face while they sleep. The inside fiber is made of soft, comfortable polyester that is sturdy even as it is as soft as a cloud. It’s the perfect size for your toddler’s head and for the premier place on their bed. It even works well as a travel pillow for long trips. They will love it, and you’ll love that your child is comfortable! It’s the best first pillow for toddlers that we found on our list, due to all the features and comfort that it provides. It will make bed and naptime fun for your child, and they will wake up rested, instead of being cranky and tired when they get out of bed! Utopia Bedding makes the best type of pillow for toddlers to use, which are the perfect size and dimension for smaller people, as well as being soft enough that your child is always comfortable no matter how they like to sleep. The cover is made of 100% cotton and it’s got an amazing 240 thread count, which makes it durable and soft. The filling and the cover are completely hypoallergenic, so it won’t trigger any of your child’s allergies. You also won’t ever have to wash or dry it out by hand, because you can toss it into the machine for washing and drying without hassle or worry. It won’t go lumpy, either! By far, the best part about this pillow is the fact that you get two when you order! Make sure that your toddler’s bed looks great by having two pillows instead of the one. We love the thread count and the amazing value. This toddler pillow by Restcloud is simply amazing. It’s one of the only ones on our list that’s made of foam instead of cotton or poly filling. The cover is uniquely made of grass coral fiber, which is naturally resistant to all of the things that you don’t want on your child’s pillow. It’s removable and washable so you can easily keep it clean. The pillow has a taller end and a shorter end, so it can be used anywhere from age 2 to age 7 by switching the end that the child sleeps on. 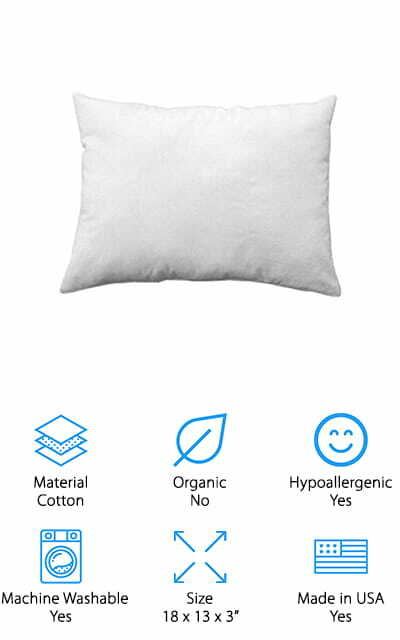 It comes with a carrying bag that will compress the pillow into a small shape, making it a great travel pillow. We’d even call it the best toddler neck pillow that we found. The memory foam that it is made of is a medium density, which is supportive and comfortable. Paired with the grass coral fiber case, this is one unique pillow!